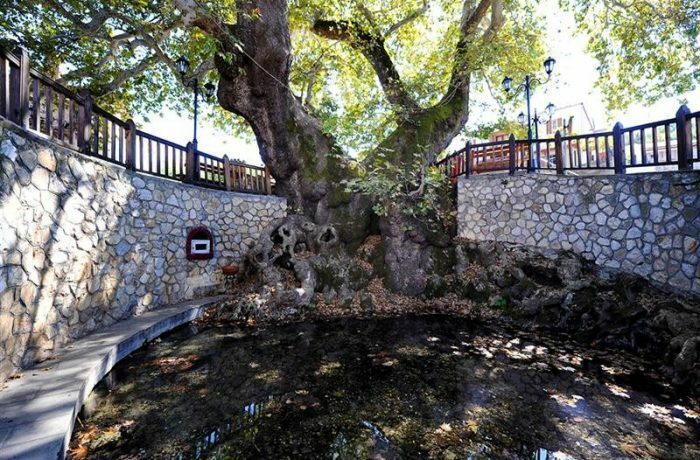 Geroplatanos got its name from the perennial plane tree (Platanus orientalis), which is 20m high, has a 15 m perimeter and is located in the main square of the village. The name Geroplatanos literally means "old plane tree" in the Greek language. The plane tree is very impressive due to its size but also, its age which is estimated to be 800 year's old! The Platanus was designated a listed monument of nature in 1975. The story of Geroplatanos village dates back to 1795 when seven families came and built houses from the Liavska area, 6 kilometres north of the village. Until 1928, the toilets were called "Tubs", which means hot water, coming out of the roots of the plane tree. From 1928 he was named Geroplatanos. On the west side of the village, you will find the chapel of Panagia, where every year on the 14th and 15th of August takes place the Feast of the Virgin Mary, which is then followed with a big celebration full of traditional dishes and dance.